Home / romantic spells in Goa / What are beautiful places that may cast a perfect romantic spell for couples? What are beautiful places that may cast a perfect romantic spell for couples? 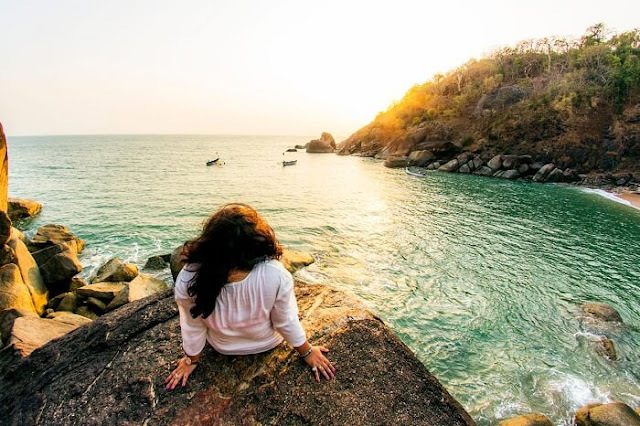 Located to the North of Palolem, in between two hills, Butterfly Beach is one of the most romantic places in Goa for honeymooners. As there is no road connectivity to this place, you need to take a boat ride to reach this place. You can access this beach by Cavelossim-Assolna Ferry across the Sal River. Betul Beach is a picturesque fishing village known for offering stunning views and tranquillity. Its beautiful and serene setting pushes it to the category of most romantic beaches in Goa. Romantic couple’s favourite, Bamanbudo Waterfalls is a gorgeous cascade comes out of lush green forests. Its milky looking water, verdant landscapes, and melodies of birds chirping make it out of the box romantic place. Fifth largest waterfall in India, Dudhsagar looks absolutely stunning when its cascades strike at big rocks. 60 km of long scenic drive through lush green forests take you to this mesmerizing waterfall. This Waterfall looks outstanding and you can spend hours sitting near its crashing point. If you are looking for a spell-bounding and serene location in Goa, Charao Island is one of the finest choices. Surrounded by verdant mangrove vegetation, this Island is a part of Salim Ali Bird Sanctuary and it houses rare and beautiful bird species. Known for its architectural beauty, Sinquerim Fort is a wonderful place to flock. Those who are not interested in visiting some popular places; they can surely choose this fort for a romantic hangout. Not only sunset viewing but swimming, surfing, skiing, and fishing are also better romantic options. One of the most popular and largest forts in Goa, Fort Aguada is the beautiful gift of Portuguese Rulers to Goa. Located stunningly, Fort Aguada is one of the most famous tourist places in Goa. The hilltop fort amazing sea views and romantic couples love to reach this point. If you are looking for a romantic dinner date, choose Tuscany Gardens unhesitatingly as it offers delicious Italian food like risotto and bruschettas. Tuscany Gardens is one of the most romantic and dreamlike restaurants in Goa where a large number of lovebirds come to eat every day. A popular riverfront retro pub, Down The Road in Panaji allures youngsters and love couples. The restaurant offers a pub and dance floor on the ground and restaurant on the first floor. Couples can enjoy live music and can dance while enjoying champagne drinks. Book Goa Honeymoon Package from Delhi and enjoy all that romantic what Goa has.